In our family my daughter LOVES to listen to her music. So much so that she prefers quality headphones over earbuds. She says earphones like the SOL REPUBLIC ones are so much more comfortable to wear and of course they sound better. 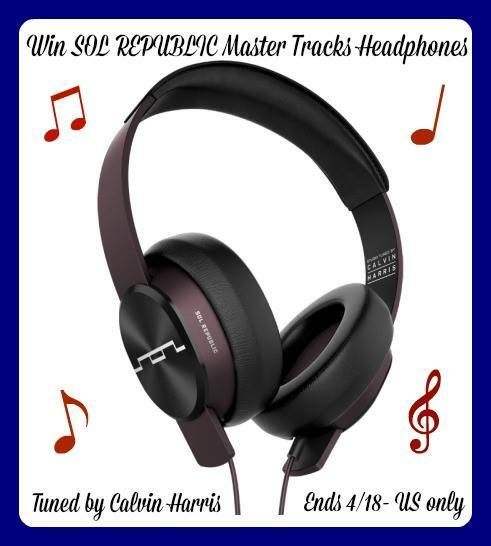 My daughter is drooling over these headphones, she wishes she had a pair, lucky for all our readers you have a chance to win a pair of your own! SOL REPUBLIC Master Tracks : . Master Tracks provide noise isolation and amazing lightweight comfort. Studio tuned by Calvin Harris. Master Tracks XC isn’t just another music artist’s headphone, it’s a headphone for music artists. With sound that’s acoustically accurate for music artists to use in the studio, and style, lightweight design and durability for use everywhere else, Master Tracks XC over-ear headphones deliver professional-grade sound with a modern headphone design. Custom tuned by multi-platinum producer, recording engineer, singer, songwriter and collaborator Calvin Harris, they’re the pinnacle headphones for music artists and music lovers alike. Want to give the gift of music for Mother’s Day? Go to Radio Shack to buy Master Tracks! Heavy metal and classic rock. Rock is my favorite genre. Huge 80″s hairband fan. I love old School R&B. I love the 80’s music! Definitely my favorite! i listen to a variety of genres. i can’t say i have a favourite. mainly symphonies guitar music ! this to keep listening to a good quality music !! I love rock music ! I listen to rock from the 80s and 90s. I pretty much love ALL music – but probably most especially “classic rock” and classical. It really depends on my mood and everything else that’s going on! I like most pop music. I love Christian Music, Classic Rock and Country Music. I like hip hop and oldies. I like oldies and Christian music. My fave genre is alternative rock. I’ll listen to anything except rap. I like country music ! Jenifer Lopez she I like all of her songs ! I like Rock, Pop, and Country Music, but I listen to other types, too. Thank you for the giveaway!! I like rock/metal the best, but love other types as well (except country and most rap). Dance music…so i guess that is mainly pop! I listen to soundtracks at work because I find them relaxing and they remind me of the movie from which they came. I like all kinds of rock, some rap, ’60’s music. Demonic music if I am in the mood. i love more than 1 genre of music, i like hip hop, dubstep, pop, etc. I will always be an unabashed lover of 90s pop like Spice Girls, Backstreet Boys, and Britney Spears! Thank you for the chance to win. My favorite genre of music is christian. I love old country and 70’s and 80’s rock. I like alot of genress. Country, oldies but goodies, jam music, the alternative music. My favorite genre is classic rock. My favorite is classic rock. My favorite Genre of Music is Pop. Rock music is my favorite. I sometimes listen to country though. I’m a basic rock lover, but appreciate most types of music! I like 80s music and a lot of the alternative newer stuff. I love the oldies but goodies. I love several kinds of music, but country is my favorite. I love classic southern rock. It’s a tie between Christian and Classic rock! I really like all music. If I really had to pick I would say pop is my favorite. My favorite genre is Jazz. I like 70s and 80s! Christian Gospel is my thing. I’m a sucker for female singer/songwriters.